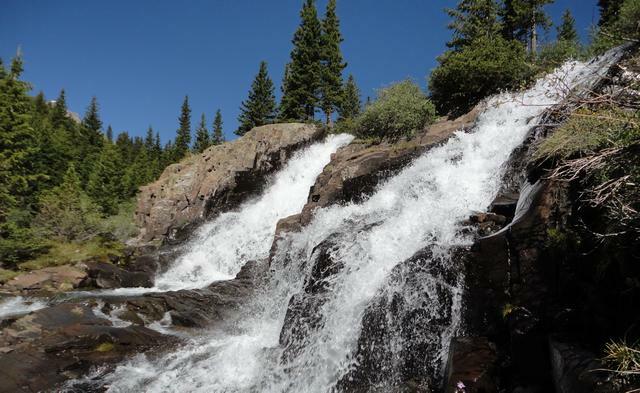 Twin Falls at Yankee Boy Basin on June 8th, 2012. The water level is quite low for this time of the year. Gary Garren and I had a great ride last Friday, 8 June 2012. Gary has his new (to him) Kawasaki 250cc dirt bike and is breaking it (and himself) in, so we picked some easy rides that are also incredibly scenic. First, we rode up to Yankee Boy Basin, outside Ouray, CO.
American Bistort at Yankee Boy Basin. A nicely-formed sample that will continue to grow and open up a bit. 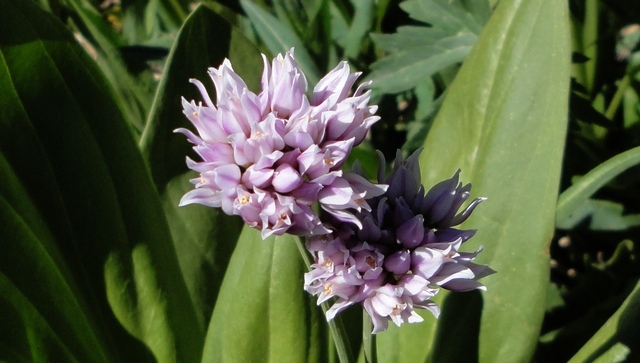 The flowers for which Yankee Boy Basin is famous aren’t out yet. Normally the best time to see them is at the end of July. But this year…who knows? Everything is a month early and we haven’t had any significant rain in weeks. I did find the American Bistort shown in the photo above. It isn’t open all the way yet. In a few weeks I hope to see columbines and many other species. Gary poses in front of the falls. The top waterfall is Twin Falls. The road up to Yankee Boy is in great shape and we had no issues. On our way down we encountered a passenger car, though. I encouraged them not to go too far—it is, after all, a four-wheel-drive road. Gary poses in front of the fabled Yankee Girl Mine headworks. You see both our bikes in the photo. 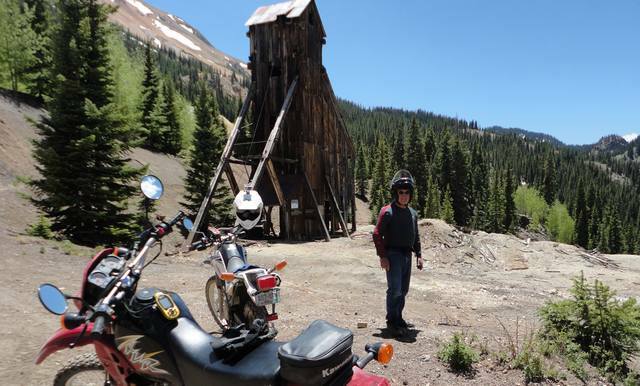 We next went to Ouray County Road 31, which takes you through the Red Mountain Mining District. The most famous citizen amongst all the ghost structures in the Yankee Girl Mine headworks. This is the structure that sits over the mine shaft with a great big pulley at the top and a huge motor to haul the bucket up and down. 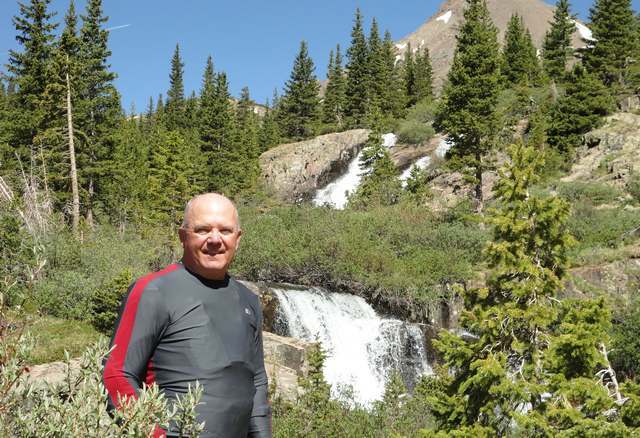 Gary thought all this old stuff quite interesting, so I suggested we attempt San Juan County Road 14, which is accessed just a few hundred feet south of Red Mountain Pass. I told him it was steep, but he was game and took to the steep road with no problem. This road, one of the best kept secrets around here, provides stunning views from away up above tree line, as shown in the photo below. Altogether, a great ride! Gary and I stopped to admire the stunning view from 12,000 feet. San Juan CR 14 is one of the area's best-kept secrets. 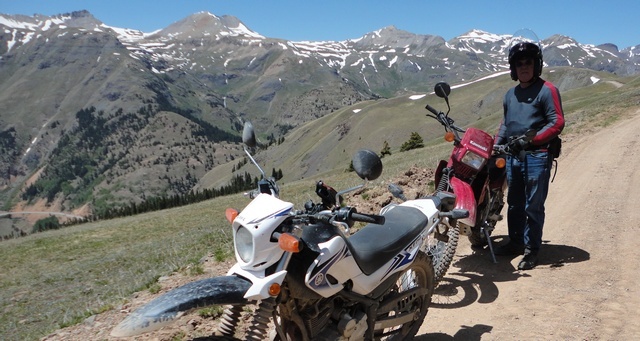 This entry was posted in Motorcycling, Ouray County, Wildflowers and tagged american bistort, Yankee Boy Basin, yankee girl mine. Bookmark the permalink. Do any geocaching while riding the trails?